After last year's pumpkin patch fiasco where we picked pumpkins in the pitch black of night, we changed tactics this year. Same pumpkin patch (because it's literally amazing), but we made the trek out there on a week night. Best decision ever. It was perfectly crips Fall evening, and we practically had the farm to ourselves. Our annual trip to the pumpkin patch is one of those adventures that isn't just for the kids. I love this stuff!!! 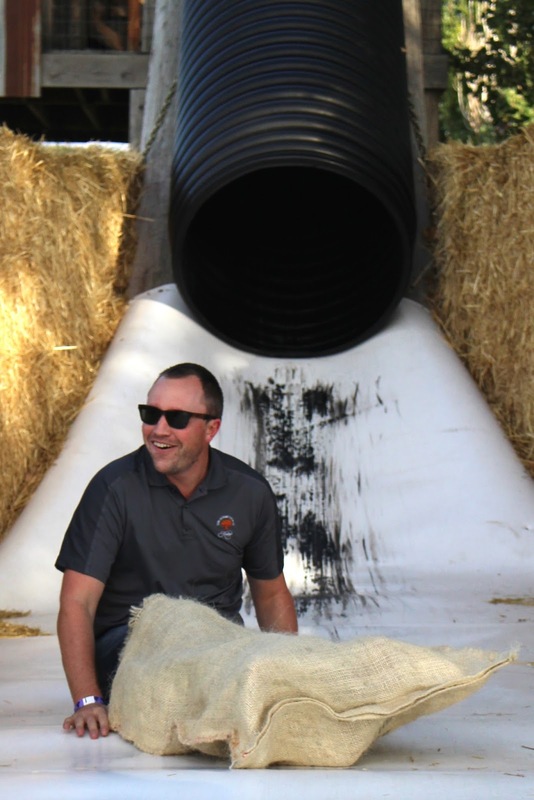 The highlight may have been this massive potato sack slide. There was no line, so Liam insisted upon going over & over again. It was intense; I felt like a child all over again. Crazy laughter all around. Liam kept telling me that I didn't need to yell "whooooooah" every single time. But I did. I could not help myself! The corn box was another big hit. Finn tried to shovel every piece into his mouth, while I made "corn angels" with Liam. 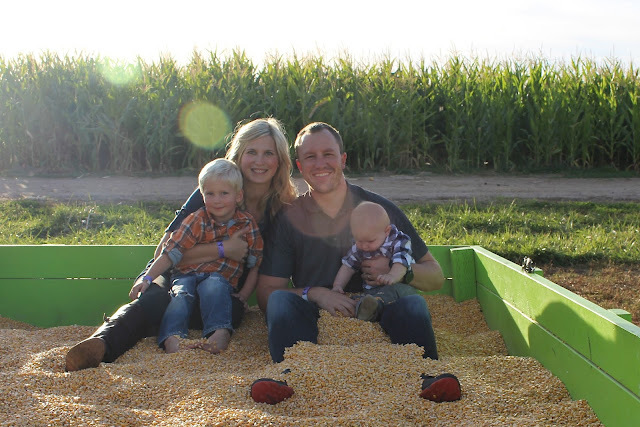 Surely the corn is perfectly clean; can't possibly be every shade of disgusting from the mass amounts of kids in it daily... Why not put my whole body in it?! Here we attempted a family picture...we have yet to nail the shot with all four members looking & smiling. Always room for improvement! We waited until the sun was setting to take the tractor ride out to the pumpkin fields. Liam thought each pumpkin was perfect and should be ours, so we had to teach him the art of choosing the very best one. He put his growing muscles to work and even carried his own. 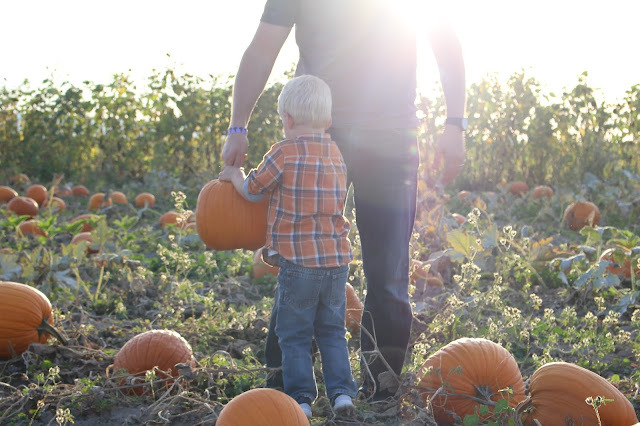 Small toddler arms wrapped around a pumpkin while waddling to the car may just be one of the cutest sights of Fall! 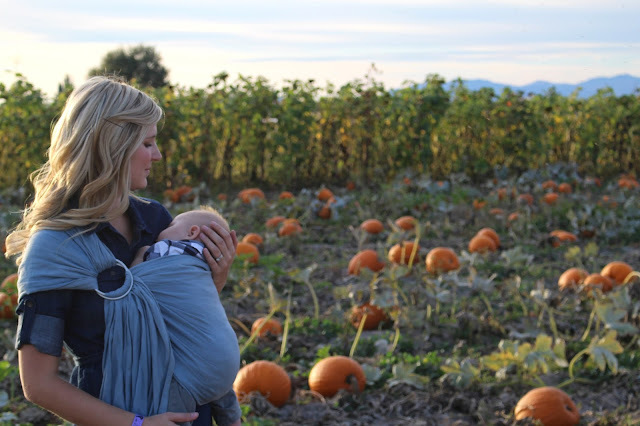 Finn had been enjoying our evening from the comfort of the sling, but then of course fell asleep right as we made it the pumpkins. So no adorable baby in a field of pumpkins shot. We picked (from the vine I may add!) a special little pumpkin just for him. I'm sure he'll try to eat it when we have our annual carving session! 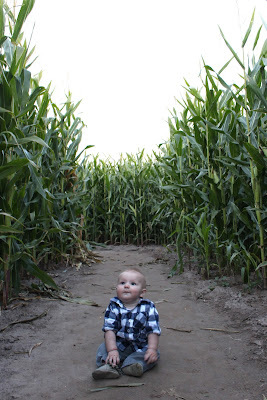 With the last bit of sun we ran through the corn maze. Liam was adamant that we not get lost, so we let him lead the way. Conor jumped out at him around various corners, which gave Liam that perfect amount of fright & delight. His little squeals filled the air. It was magical! The whole evening. It was hard to pull Liam away, and even I was sad to see it all come to an end. More memories were made that I know I will fondly look back upon. I cannot wait for Finn to be able to join in on more of the fun. Being a party of four is even better than it ever was before! So fun! You guys really look like you had a blast! That slide especially looked fun! I also love that Liam carried his own pumpkin! OH MY GOODNESS!! This is absolutely precious!! What a fun night! What a great pumpkin patch! We never have anything like this, we just a place where we get pumpkins. 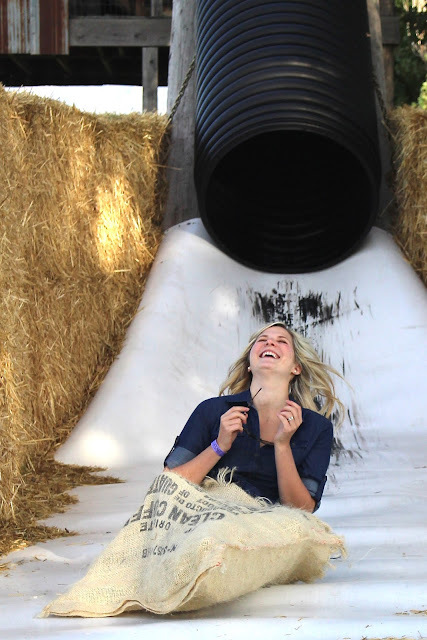 That potato sack slide looks like so much fun! 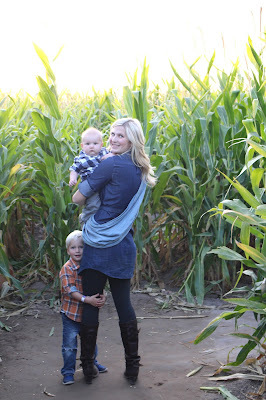 And I just love the shot of the four of you in the corn box - so cute! "being a party of four is even better than it was before." Right?! It's SO good! this is seriously amazing! love the photos, it looks so fun. good to hear it was better than last year. 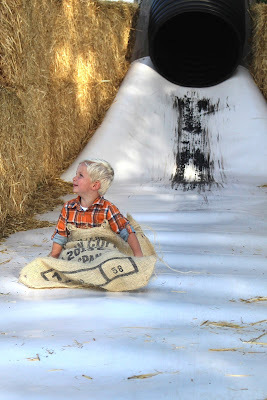 i want to go down that slide! 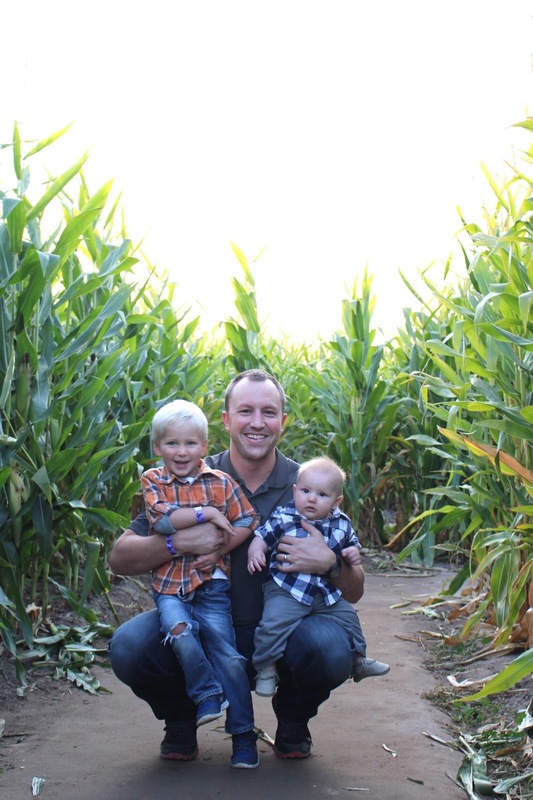 Love the pics of the men in your life but that pic of you is perfection! SO fun! We are planning to go hopefully this week! Such a perfect day!! Love that picture of you going down the slide! You guys are the cutest! What a fun evening! The pictures are adorable. And how nice to practically have the farm to yourself.